Breast cancer is the most frequently diagnosed cancer and the leading cause of cancer death in women worldwide, with nearly 1.4 million new cases annually . Progesterone and estrogens have long been linked to breast cancer [2, 3], and current understanding of the effective actions of these hormones implies the presence of receptors (ER and PR) in the target cells [4, 5]. 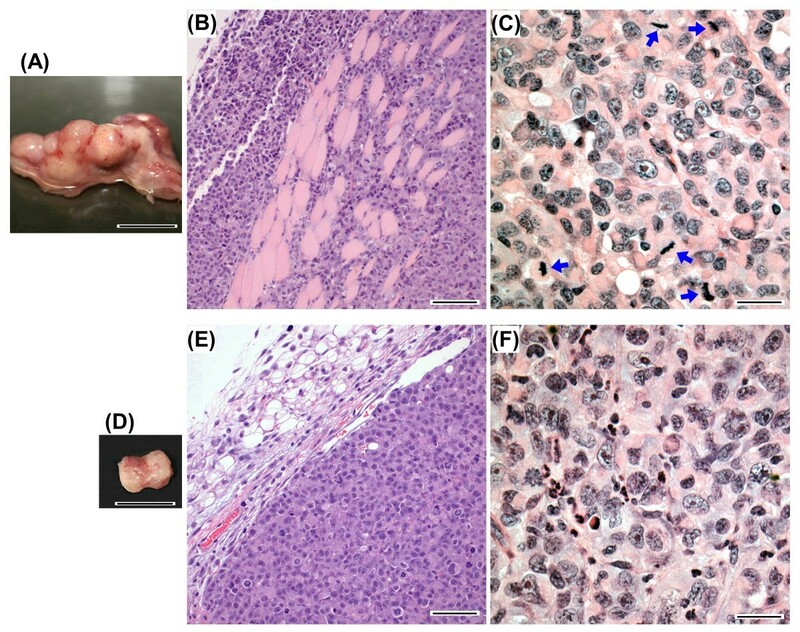 However, a large proportion (about 30% to 60%) of breast tumors are ER and/or PR negative [4, 6–8], and about 90% of normal proliferating breast epithelial cells are receptor negative . Patients with receptor-negative tumors generally show lack of response to adjuvant hormone therapy and have significantly higher risk of mortality compared with patients with tumors that are ER and/or PR positive [10–14]. Overall, this means that for receptor-negative breast cancers, current explanations based on estrogen and progesterone actions and receptors are inadequate, and the related hormone-based therapies are ineffective. Here evidence is presented that the progesterone metabolites, 5α-pregnane-3,20-dione (5α-dihydroprogesterone; 5αP) and 4-pregnen-3α-ol-20-one (3α-dihydroprogesterone; 3αHP), can regulate ER/PR-negative breast cell tumor formation and growth as well as tumor regression and maintenance of normalcy. Estrogens and progesterone have long been considered to play cardinal roles in breast cancer, and therefore, expressions of ER and PR are widely used as indicators of hormonal dependency [4, 25] and as determinants for current hormone-based treatments . The relevance of the steroid receptors is highlighted by observations that ER/PR-negative breast cancer cells such as MDA-MB-231, which normally do not respond to estrogen and progesterone, can become responsive, both in vitro and in vivo, if they are transfected with the receptors [27, 28]. Thus, the prevailing theory of hormonal regulation of breast cancer, as well as hormone-based therapies, revolves around estrogen and/or progesterone and ER/PR-positive breast cells and tumors. However, a large percentage of breast tumors are ER and/or PR negative [4, 6–8] and therefore are not explained by the actions of estrogen and/or progesterone. Not only do these "receptor-negative" breast cancers fail to benefit from current hormonal therapies, but they also generally exhibit more-aggressive biologic behaviors and poorer prognosis than the receptor-positive ones [10–14]. The results of the studies reported here show for the first time that the progesterone metabolites, 5αP and 3αHP, act as hormones that regulate ER/PR-negative breast tumor formation, growth, and regression. 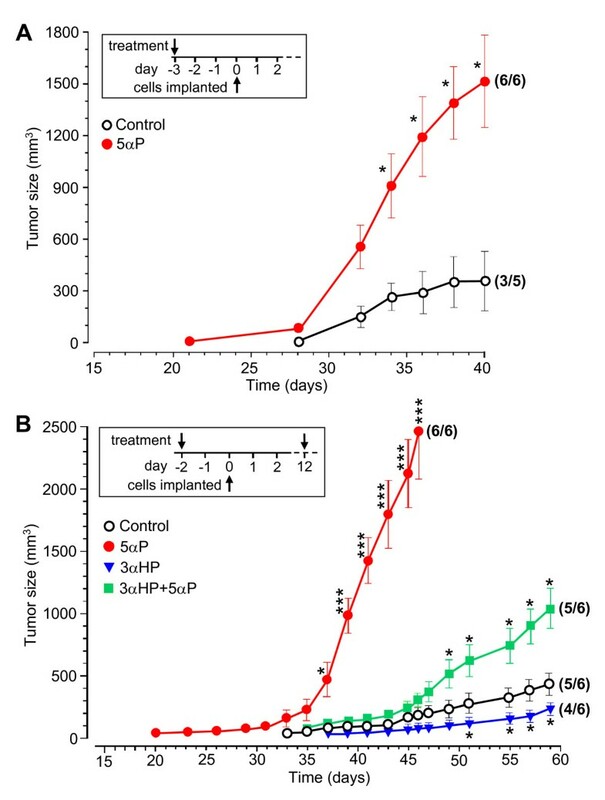 The onset of the ER/PR-negative human breast cell tumors in mice was considerably accelerated, and the growth significantly stimulated, by just one or two applications of 5αP. In contrast, 3αHP retarded onset of tumor formation, suppressed tumor growth, and inhibited or regressed existing 5αP-induced tumors. When both hormones were administered simultaneously, the effects of one were abrogated by the effects of the other. 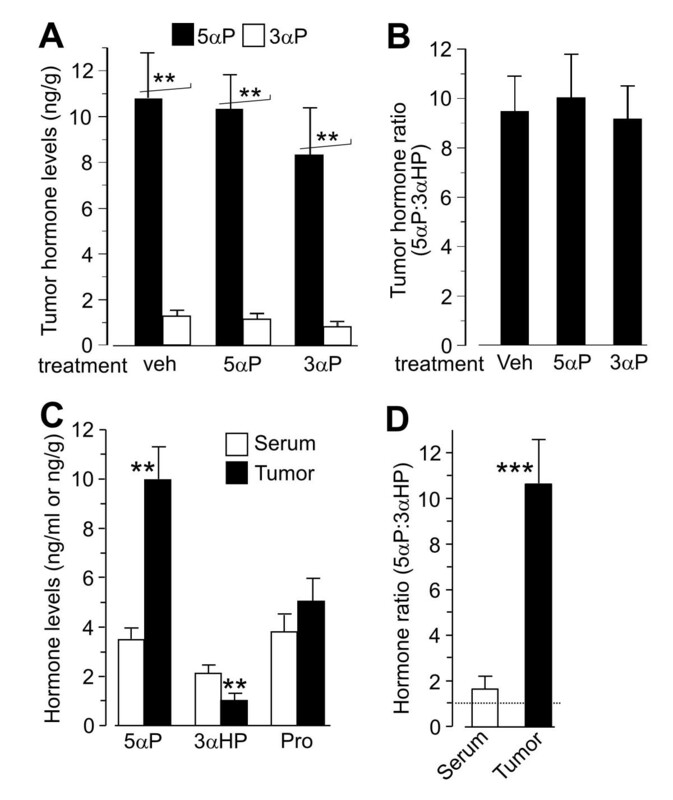 The current in vivo demonstrations, from five separate experiments, of the opposing actions of 5αP and 3αHP on tumorigenesis and tumor growth extend the previous findings, which showed opposing in vitro cancer-regulatory actions of these progesterone metabolites on receptor-negative (MDA-MB-231, MCF-10A) as well as receptor-positive (MCF-7, T47D, ZR-75-1) breast cell lines [15, 17, 18]. The significant concentrations of 5αP and 3αHP, and particularly the high 5αP/3αHP ratios, in the MDA-MB-231 xenograft tumors, emphasize the potential importance of the microenvironment within breast tissue where the biologic actions occur. The role of the microenvironment in changing the expression of regulatory factors such as metabolizing enzymes, receptors, cytoskeletal and adhesion molecules, and growth promoters/inhibitors and in epigenetic alterations has been extensively reviewed [36–40]. 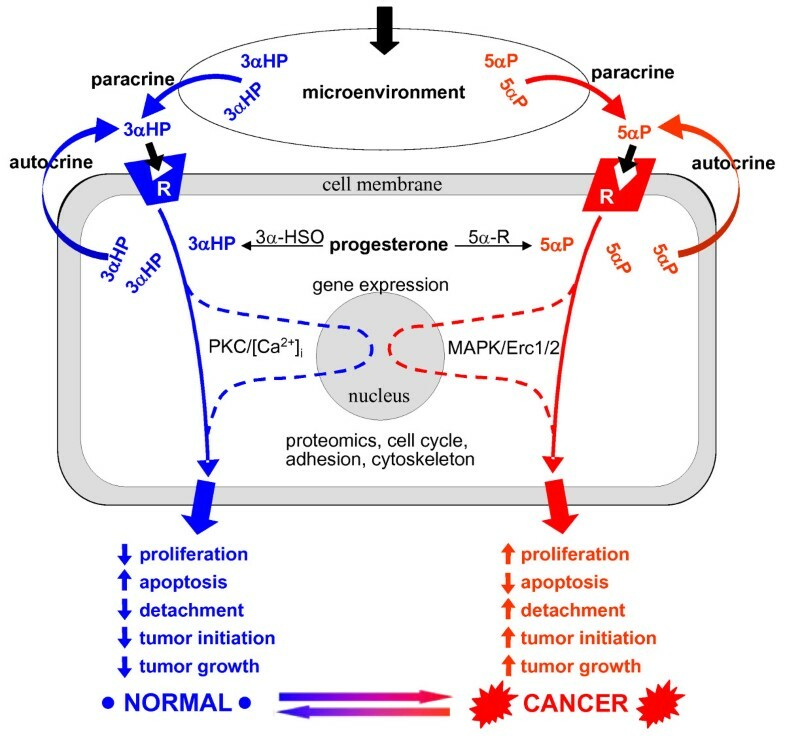 The current findings, along with the previous in vitro studies, suggest that the relative concentrations of 5αP and 3αHP in the breast microenvironment constitute important autocrine/paracrine determinants not only for tumorigenesis but also for potential regression of tumors and the maintenance of normalcy of ER/PR-negative breast cells/tissues. Figure 8 provides a summary of opposing biologic actions and proposed mechanisms of action of the progesterone metabolites, 5αP and 3αHP, in promoting neoplasia and tumorigenesis, as well as in maintaining normalcy in ER/PR-negative human breast cells. 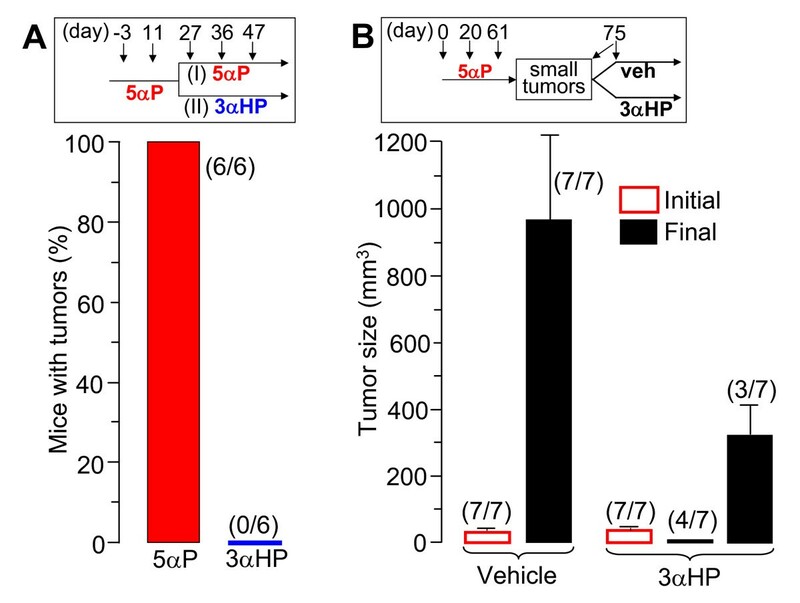 Evidence presented here shows that a high concentration of 5αP, relative to 3αHP in the microenvironment, promotes initiation and growth of tumors, whereas a higher concentration of 3αHP, relative to 5αP, suppresses tumorigenesis and promotes normalcy. 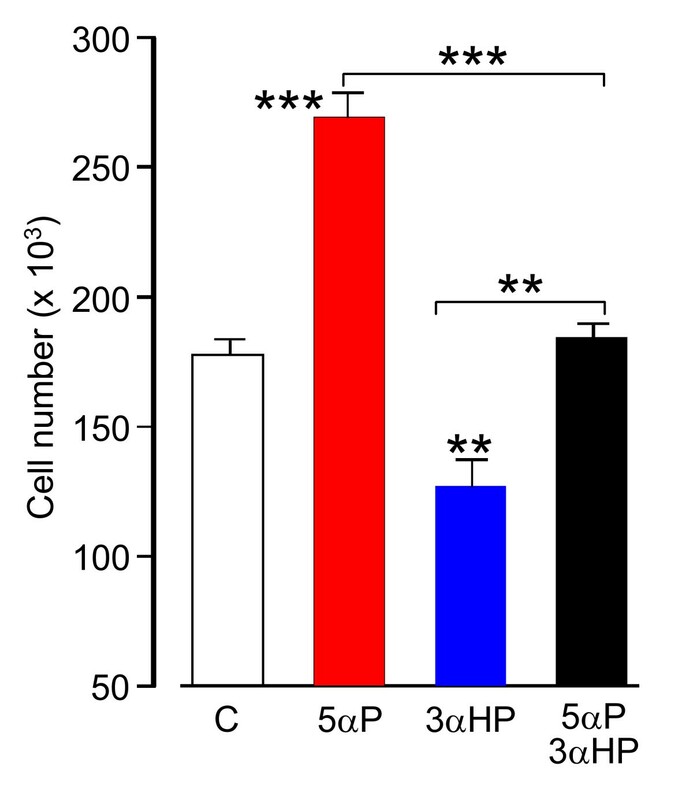 Previous evidence indicates that these opposing effects of 5αP and 3αHP are propagated via the opposing actions of the hormones on cell proliferation (mitosis, apoptosis), adhesion, cell cycle, regulatory and signaling molecules, and gene expression after binding to specific receptors.